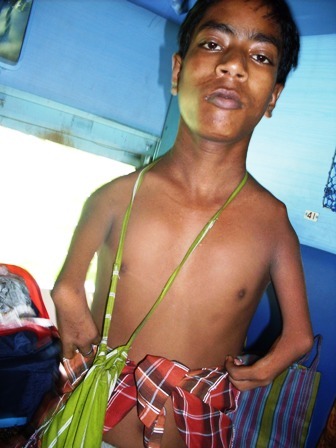 A disabled beggar in a train running between New Delhi & Patna. Photo by Pankaj Bhushan. More than one billion people today live in this world with some form of disability and encounter obstacles such as social stigma and discrimination. They also get too little health care and few rehabilitation services; inaccessible transport, buildings, and IT systems. A first ever recording of this kind compiled in ‘World report on disability’ and produced jointly by WHO and the World Bank, notes that people with disabilities have generally poorer health, lower education achievements, fewer economic opportunities and higher rates of poverty than people without disabilities. This is largely due to the lack of services available to them and the many obstacles they face in their everyday lives. The report provides the best available evidence about what works to overcome barriers to health care, rehabilitation, education, employment, and support services, and to create the environments which will enable people with disabilities to flourish. Such startling ‘revelations’ that we witness with our closed eyes everyday, should make governments and charity organizations to invest more leadership and financing in the services and programmes that could unlock the potential of people with disabilities. Don’t we need to help people with disabilities to gain equitable access to opportunities to participate and contribute to their communities. They have much to offer if given a fair chance to do so. Isn’t it? Read The Full Report By Clicking Here. You may watch the videos below to understand what disability is? More Personal Narratives Can Be Found By Clicking Here. Previous 115 million kids in hazardous jobs worldwide; Can you bring smile on their faces? If an individual’s disability is of a progressive nature and considering the human rights that individual has no option but to apply for a grant so as not to become a burden on society, where should he/she apply?